UPDATE: As this is quite a significant development a new article, outside of the blog section, has been created. You can read it here. The original blog post remains below, it will no longer be updated. UPDATE: Virgin Trains East Coast social media team have confirmed that there's been no internal comms regarding this so it looks like it affects West Coast only, of course there may be a delay for the information reaching the East Coast team so we will keep an eye on things and update here if needed. Today (5 July 2017) I received an email from Virgin Trains (the west coast one) you can see the full email here. From 1 August 2017 Virgin Trains will give Flying Club points at a rate of 1 mile per pound spent. The current rate is 2 miles per pound. This rate applies to all journeys taken from the 1st August even if they were booked before this notification. The email is not clear whether it applies also to Virgin Trains East Coast, the only mention that the email was sent from West Coast is the legal information in the footer. We're still waiting for confirmation from Virgin Trains East Coast as to whether they're following suit, recently marketing email from Virgin Trains West Coast have started putting 'West Coast' clearly on the header, but this Flying Club email did not. As this email from a few days ago shows the current style it seems a bit odd that an email about a loyalty scheme common to both franchises didn't make this clear. However, if we look at the Virgin Atlantic web site, the west coast pages mention the earnings cut but the east coast pages do not (at the time of writing). So it could well be the case that only the services on the west coast will be affected. We'll keep an eye out and update this page if there's any news. So far there's been no announcement about a cut in Nectar earnings. The only response so far on Twitter to negative feedback regarding these changes is that they're doing so to invest in improvements. Most of us will take that with a pinch of salt. The full Twitter response by @VirginTrains was over two Tweets and said "We also want to invest in other ways we can improve our service, Ben. However, the offer to still claim miles in [sp] remaining ^MW"
Even if this earning cut doesn't affect East Coast it's still a bad sign for the future direction of recognition within the two companies. Virgin Trains West Coast has offered Flying Club miles for years, even before they partnered with Nectar. The amount of miles you could earn on rail travel never compared to the amount you could earn when flying an airline with a frequent flyer scheme and now it's going to be even less competitive. Despite being part of the 'Virgin Family' and significantly more valuable than Nectar for those who use Virgin Atlantic it has always felt that Flying Club was always treated as second class to Nectar. It's rare that you get a bonus miles offer for rail spend, whereas Nectar have been offering a number of promotions for both East and West Coast. Even the best Nectar promotions are nowhere near as generous as East Coast Rewards but it's bad that those who chose Flying Club have got very few bonuses, I can't remember a single one in 2017. Virgin Atlantic has a major competitor, British Airways, you may know Richard Branson is a little obsessed with trying to outdo them. British Airways has the advantage of a short haul route network, you can earn Avios (miles) and Tier Points flying them on domestic routes that compete with both of the Virgin Trains franchises. Surely it benefits Virgin Atlantic and Virgin Trains to work closer together? Give those that fly Virgin long haul a reason to use the train for their domestic trips and give regular Virgin Trains users a reason to use Virgin Atlantic for their holidays. 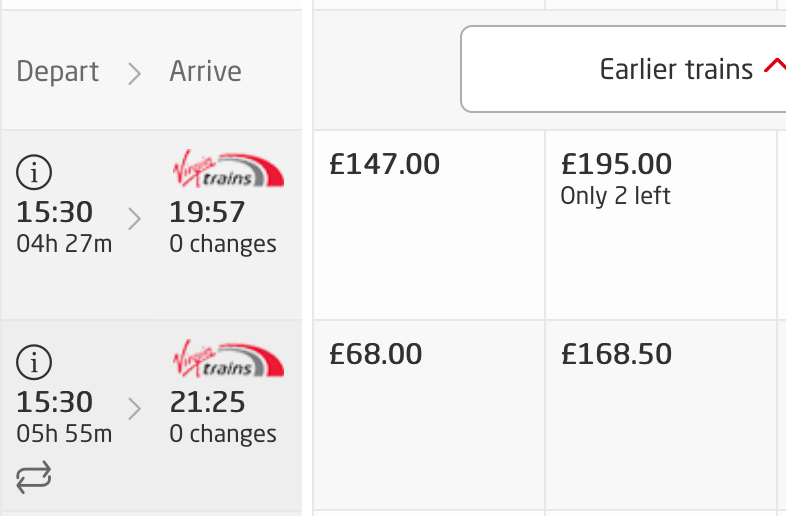 The key rule is you must book on the correct site for the franchise: virgintrains.com for West Coast and virgintrainseastcoast.com for East Coast, book on the wrong site and no miles for you! The new Virgin Trains East Coast beta site 'helpfully' displays a Virgin Trains logo regardless of whether the train is East Coast (earns miles) or West Coast (doesn't) select the wrong train and you'll get nothing! Any train ticket, for any rail operator booked on eastcoast.co.uk used to earn East Coast Rewards points. These points were also earned on extras purchased such as Plusbus and catering vouchers. Now to get points it's needlessly complicated and the points are much less useful. You would think that if two companies are going to share a brand they would at least try and offer a consistent and rewarding experience!